ROKPA: Monastery schools | ROKPA supports Monastery Schools in terms of education and transfer of knowledge. 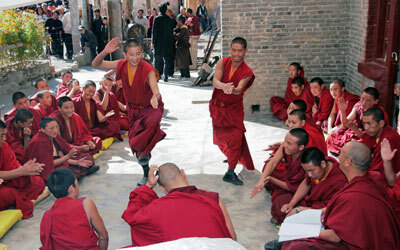 In addition to the usual school subjects, monasteries pass traditional Tibetan knowledge to theirs students. ROKPA supports Monastery Schools as they make a valuable contribution to the conservation of Tibetan culture. The school children educated in monasteries are taught, in addition to the usual school subjects, traditional Tibetan knowledge, which they pass on to future generations. Schools in monasteries rarely receive state funding. Nevertheless, they are vital for the conservation of the Tibetan written language. This is because it is only there that monks and nuns can concentrate on intensive language study. It is then ensured that the works of Tibetan literature and science that have been written and collected for more than a millennium are understood by future generations. Education in the monastic universities can take up to 15 years. The monks and nuns educated in this manner are then employed as teachers in either village or monastery schools. ROKPA supports five teachers and 274 boys and youngsters financially at this monastery school. The students are from rural and nomadic families who live up to 250 km away. They are between 5 and 28 years old and are divided into classes from 7 to 29 pupils. The program of the primary school lasts seven years, the one of the secondary education 10 years. ROKPA has supported this educational institution since 2007. Although the monastery is very large, the operation of the monastery school would not be possible without the financial support from ROKPA.